Petaluma’s historic silk mill, which still stands today in the city’s Midtown neighborhood. Within walking distance of downtown and brimming with Sonoma County history, Petaluma‘s Midtown neighborhood is a popular choice with first-time buyers, thanks to both its convenience and relatively affordable homes. Located just east of downtown, Midtown is tucked between Highway 101 and the Petaluma River. Area residents are a 10- or 15-minute stroll from the city’s downtown area, accessible via a pedestrian pathway on the historic D Street Bridge or East Washington Street. As an added convenience, the future SMART train will have a stop in the neighborhood, offering commuters a stress-free way to travel to Marin County and San Francisco. Midtown itself has its own colorful history that dates back to Petaluma’s earliest days. The neighborhood is home to what is locally believed to be the oldest property in Petaluma — the Bill Soberanes House on Washington Street — constructed in 1858, the same year the city was founded. In the late 1800s, a silk factory opened in the neighborhood, where raw material from China was fashioned into thread and shipped to San Francisco. Later, the factory produced silk used to make parachute cords during World War II as well as for early space shuttles. 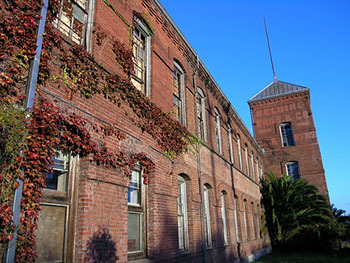 Built in 1892, the original red-brick building still stands, and investors recently purchased the dormant facility. Today Midtown has about 1,000 homes, ranging from smaller bungalows built in the 1950s to more historic properties like the aforementioned Washington Street home. According to one of Pacific Union’s top Petaluma real estate professionals, the neighborhood draws many first-time buyers, not only for its convenience, but also because it is more affordable than some others on the city’s west side. Retirees downsizing to smaller properties are also frequent Midtown buyers. Shopping options in the neighborhood are plentiful, including a large shopping center that mostly features chain retailers and restaurants, as well as a strip of businesses lining East Washington Street. Residents also enjoy access to a Whole Foods Market and a few mom-and-pop retailers and waterfront restaurants. More local businesses and eateries are downtown, just across the river. Because of its riverfront location, neighborhood residents enjoy a variety of outdoor activities, including kayaking, paddleboarding, and fishing. Hikers will enjoy the Lynch Creek Trail, while Kenilworth Park offers a playground and recreation center for children. Families will also appreciate access to the Petaluma Swim Center, which offers two outdoor pools for beating the heat during the hot Sonoma County summers. Live Oak Charter School is known as one of the best in Petaluma, and locals say that McKinley Elementary School has greatly improved over the past few years. According to our real estate professional, homes in the neighborhood generally sell for $450,000 to $550,000. Currently, he puts the average sales price for a Midtown home at $470,000.